My Mennonite Aunt Ruthie Longenecker is elderly now. 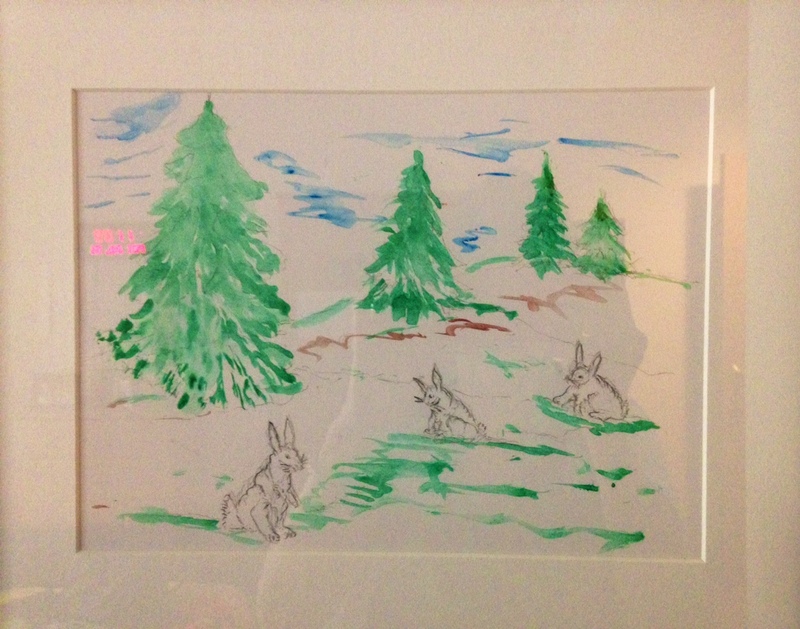 She has always loved art and is still producing beautiful things nearing age 97. 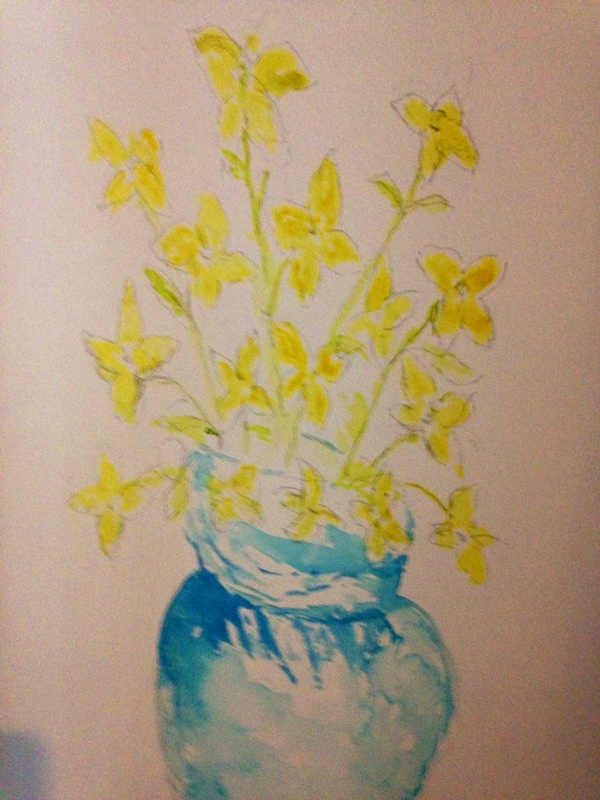 Like Mary Delany, known for her exquisite scissors art, age is no hindrance to creativity. Note the red and teal crayons in Ruthie’s hand here. 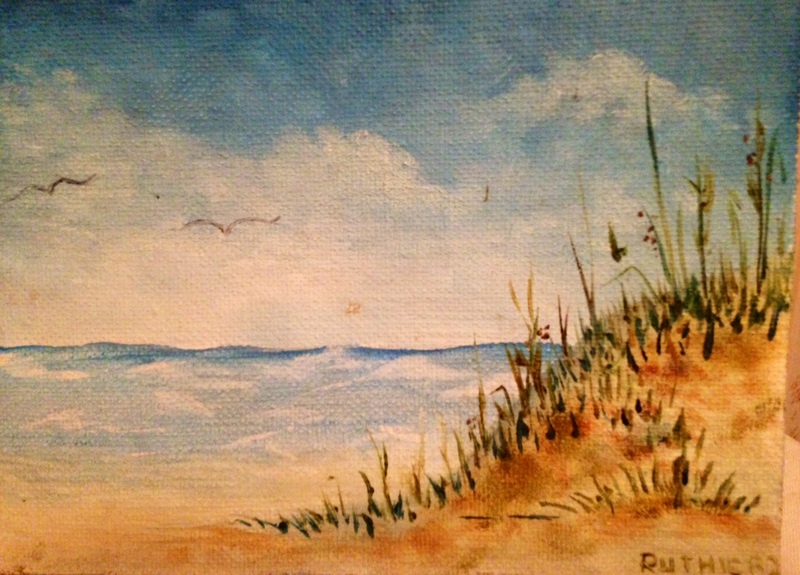 My Artist/Aunt/Teacher Ruthie now lives in a retirement community, where she took an art course several months ago. I have no way of knowing whether the instructor suggested the topic or not, but one thing is certain, her images reflect her deep love of plant and animal life. Finger paints – My favorite, blending red and blue to make purple! True, she taught the 3 R’s – reading, writing, and ‘rithmetic. I excelled in reading and was often chosen to read aloud “with expression” when the school superintendent appeared in the classroom. However, arithmetic was a different matter. I can still conjure up an image of her brown, beveled ruler dancing ominously above my hand, white-knuckled while struggling to line up 4-digit numbers vertically so the sums would add up correctly. One happy pause in the school day came after lunch though: Picking colors from the stadium of crayons standing at attention in my green & gold box of 48 Crayolas. My classmates and I filled in the *purple curves and lines of figures from fairy tales and fables while she read from Uncle Remus or the tale of Rumpelstiltskin. She took a course in oil painting, probably in her 40s or 50s, her love of nature evident in the works shown here. Aunt Ruthie/Miss Longenecker would likely smile in a self-deprecating way at the notion of linking her artistic flair with the idea of “art as sacred expression” which Melissa Pritchard asserts in an article suggesting that “Art [is] a form of active prayer.” Yet, in retrospect, I recognize that art for Aunt Ruthie was a full expression of her humanity, her creativity, and her spirituality. On July 16, 2015, the U. S. Senate passed ­­­­by a vote of 81/17 a bi-partisan Elementary and Secondary Education Act to ensure that “all students—regardless of their socioeconomic status—experience the demonstrable positive impact that [art] and music education has on learning and life.” In other words, the Senate is trying to catch up with what the research has been saying for years, the arts improve and reinforce learning in the full range of academic subjects. Ruthie would be pleased with that move. In her mind, now addled by memory loss, art never ever left the curriculum. For her, art is ageless. A wonderful post, Marian! You convey so clearly the importance of art in our daily life, and also how that creative impulse helps to connect so many aspects of our lives and minds. It also helps to connect us to others. 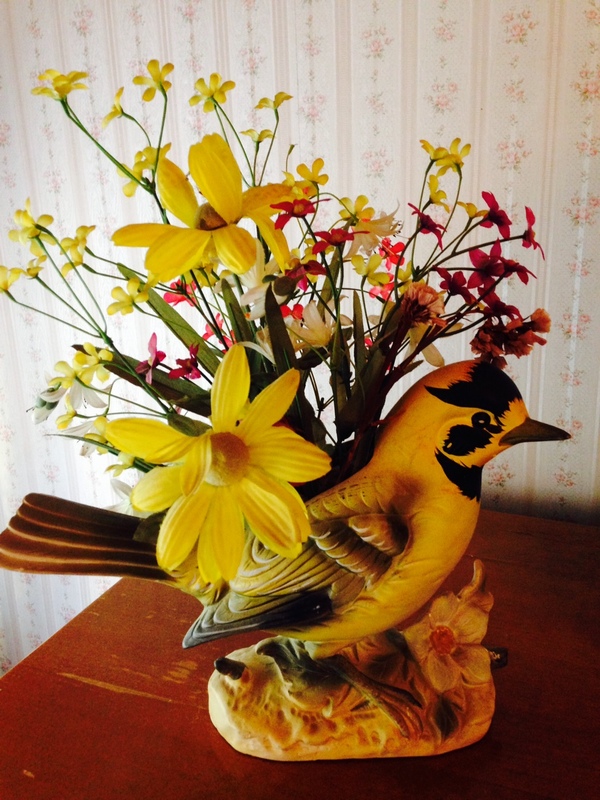 It’s great that your Aunt Ruthie still continues to make art, and that in Keat’s words her vision “will never pass into nothingness”–even that stunning flower arrangement, since it now exists here in the photograph. You paint exquisite pictures with words every week on your blog posts. And you are creative in other literary ways, some hard for me to fathom – dreaming up test questions that require critical thinking skills, developing themes in your encyclopedia series. If I were a cartoonist, I have words coming out of your ears . . . . Here you are again – first responder – always glad to see you here in this column, Merril. Oh my, Marian! Thank you SO much for the praise. You have me blushing here. I love that phrase too, Merril. Says so much with so few words. I just visited your blog and read your post for today. You are wildly creative, Tracy, and so is your husband if he is the “character” doing the antics in your photos – ha! Oh, I left a comment there too! Aunt Ruthie has appeared often in these Plain and Fancy tales, and I have grown very fond of her, Marian. You were fortunate to have a teacher, with a college education, in your immediate circle. No wonder that you became a teacher yourself, married to an artist! Aunt Ruthie is at Landis Homes, right? Maybe my mother will want to pay her a visit. Yes, Aunt Ruthie is at Landis Homes in Lititz House. She can carry on a conversation especially about life in Lancaster County when she was active. She’s always loved gardening, animals, and of course art and the theatre. I’m sure she would appreciate a visit from your mother. Thank you for suggesting it, Shirley, and for showing up here once again. I’ll suggest Aunt Ruthie and the Lititz House to Mother, who walks and drives, but more slowly now. Delete the “once” – how about “faithfully”! Aunt Ruthie would love a visit. One of her more lucid friends left Lititz House for some reason and now she sits for hours with her Word Find books which she enjoys. About the artist I married: Cliff was a divinity student when I met him. When we were married he was a youth pastor/elementary school teacher. But he was always an artist. I’m glad he could spend more than 30 years of his career devoted completely to art. A wonderful post about another remarkable woman in your life. How fortunate you were to have her as your teacher at a formidable age. Creativity is so important to learning. My daughter, the potter, did not do well in school until a teacher in high school realized her creative talents and nurtured them. She went on to graduate with honours and win three academic prizes. She now makes her living creating pottery. When I was an employment counsellor, I worked with youth at risk. They were required to sit through my job search workshops, which was a challenge for many of them. I left paper and crayons on the desks so they could doodle and create while I taught. They did very well in my classes and one young person even said, “If you had been my teacher in school, I would not have dropped.” I am so pleased the US Senate has recognized this. Art permeates your life and is expressed in so many ways. Thank you for telling about your creative daughter, the potter, and for inspiring story about the students in your class. You changed their attitudes about learning. In fact, you changed their lives, Datlene! I truly hope so. Some of them have indeed gone on to get good jobs or return to school. Some have kept in touch and thanked me for making a difference. (although in the end it was up to them, I just facilitated the process) It was a most rewarding experience for me and I am thankful I was hired for that job. When you’re young and don’t know better, you imagine all children had such advantages. The list of our artistic endeavors in early elementary school would be pooh-poohed by authorities now as too dangerous and too fanciful, taking away from what they regard as “real” academics. You are surrounded by art, it seems, and obviously have a deep appreciation for it, Fatima. My son majored in photography in under-graduate work and now teaches art (including photography) in secondary ed. Marian — I agree with all of the other responders and what they’ve pointed to that particularly touched their hearts. I’d like to add that “age is no hindrance to creativity” jumped off the screen at me. 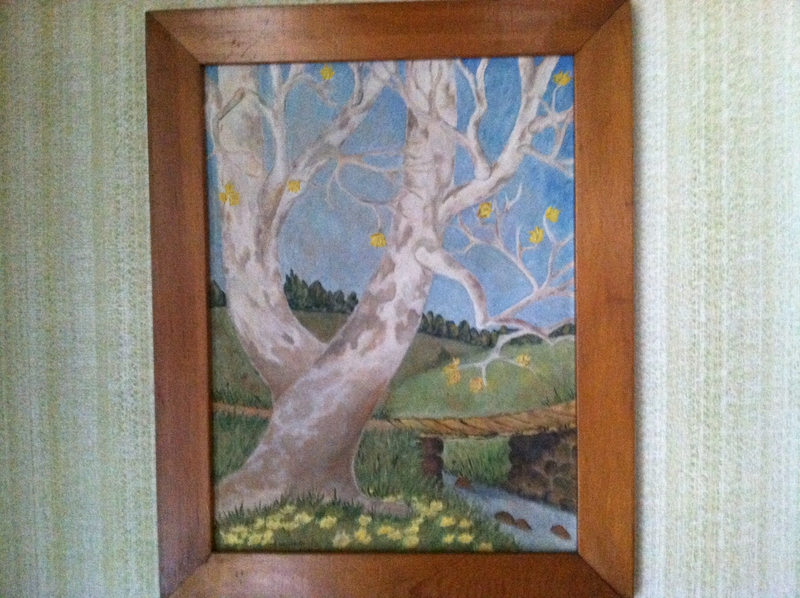 Aunt Ruthie’s oil painting of the “white birch tree and bridge along lane leading up to the Martin farm” is particularly captivating. The tree has a compelling quality that captures one’s attention. Your grandmother sounds like a variation on Grandma Moses, and I’m guessing a little less primitive in her technique. Wow! You could blog about her and all of your artistic kin. (Maybe you already have before I followed you.) You left out one artistic gift when tallying your own: writing – at which you are stellar! How wonderful that your aunt found her way to art, even though that expression was not encouraged by her (our) people in her day. I also grew up ‘plain,’ but I found my way to be trained and then practiced, as a Waldorf teacher, where the arts (including music) and handwork are seen as intermediaries for learning everything else. 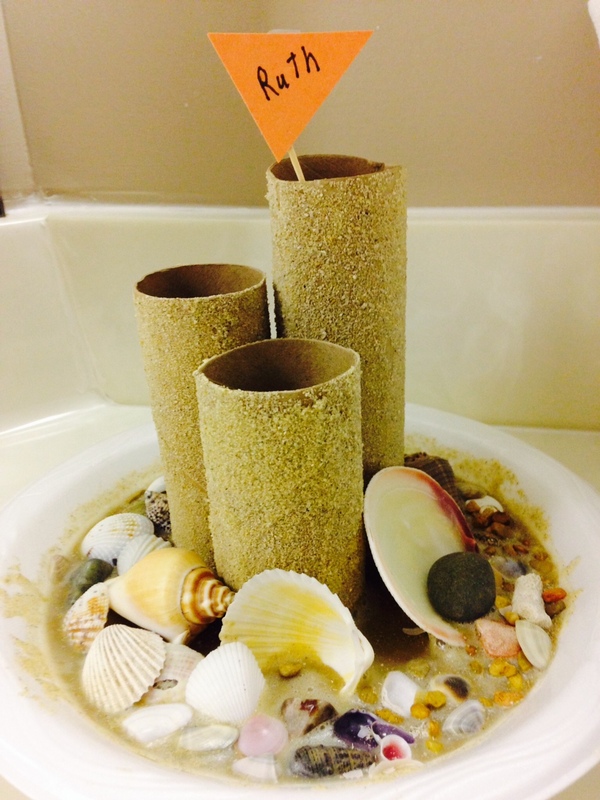 Waldorf is an international school movement, as is Montessori. In Europe, they’re often called Steiner Schools. Both my children went to Waldorf schools and are now living life artistically in the world. 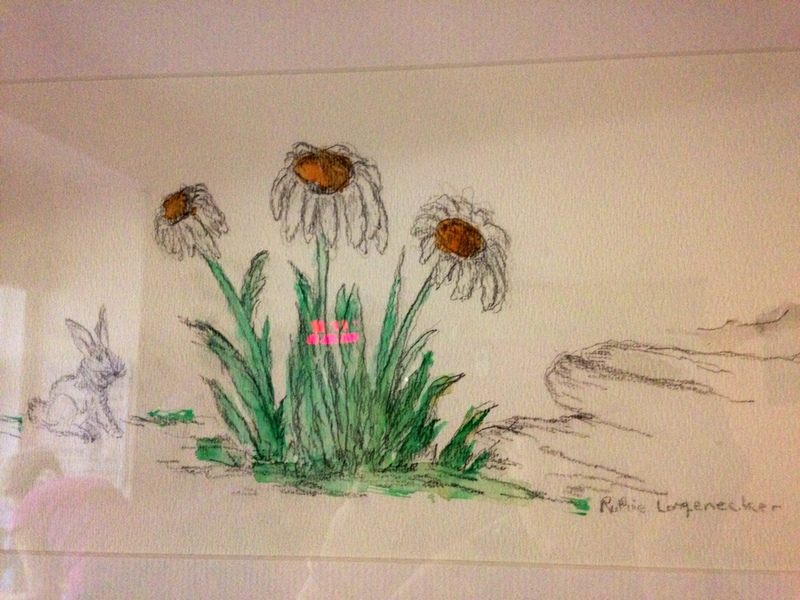 I really love hearing about Aunt Ruthie and seeing her photos and all her artwork. Maybe Aunt Ruthie was a natural Waldorf teacher, without even being trained. I must admit that I’ve heard of Montessori schools, but not of the Waldorf. Thank you for educating me here, Dolores. Aunt Ruthie was a natural at teaching and, in retrospect, she seems to transcend labels. I’d like to hear more about your artistic children. Thanks for commenting here today. I hope others will read this comment too. What a wonderful picture of your Aunt Ruthie, Marian! And the examples and details of her creativity are touching and inspiring. This is a lovely post. We have more than one strong mentor in our backgrounds, Marylin. I’m sure you recognize some qualities in Aunt Ruthie inherent in your mother, perhaps in your grandmother too. I’m glad you enjoyed the post and that we can have conversations like these to show our gratitude and appreciation. Oh Marian I am so impressed with Aunt Ruthie ‘s artwork , more so , her drive and determination never to give up what is important to her . 3 cheers for Aunt Ruthie . I have to nominate my amazing sister who is constantly making the most beautiful quilts ( I have praised her before on your previous posts) . If she isn’t quit making she is making something and she suffers with painful joints . I look forward to reading your personal tales here. They always fit in. Yes, I do remember you commenting about your sister’s quilt-making, probably when I published a blog post about Mennonite quilts. Maybe sometime I can meet this amazing sister – and YOU too! Earlier on my blog I shared about my Aunt Florence who you compared to your Aunt Ruthie so I enjoyed reading this. But wow, to have an aunt for a teacher for four years–what an influence. So I detect math wasn’t your forte (nor mine). But spelling usually is–so I stumbled over biartisan describing the new bill passed for arts and music education. 🙂 I pick on that here because I thought, oh, is it bi-artisan because it includes both Aunt Ruthie’s kind of art and also music?? Checking the link I see iof course you meant bipartisan but I like your inadvertent coining! Lovely! And great to know about that bill — gets my support. oops now I left a typo above. Well, I guess we’re even now. Only an editor with a kind eye would rationalize my misspelling of “bi-partisan.” If I’m going to make a mistake it might as well be clever. Right? Spell-check didn’t catch my inadvertent coining and neither did Cliff, who usually proofreads my posts and notices typos. Actually, reading the text with an artist’s eye, he says he thought it was intentional. Yes, I checked back on your older post to recall the similarities between Aunt Flo and my Aunt Ruthie. Thanks always for sharing in the conversation here, Melodie. You always encourage and/or instruct. 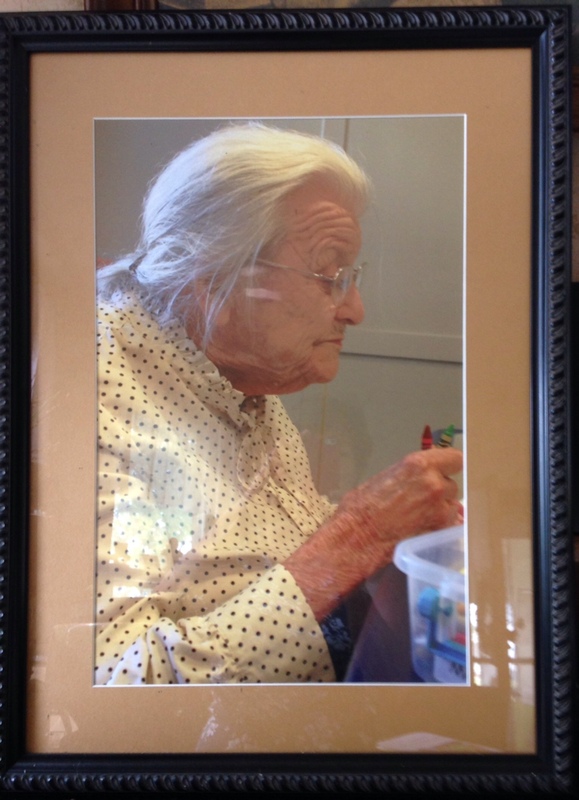 Love the picture of aunt Ruthie. Love her artistic and detail of her pictures of art. Yes she has always loved animals and gardening. I love visiting her when I’m in PA. Sad I didn’t make it there this summer. Hope to get there before the snow, even if just for the weekend. Thank you for this post. I love art and excelled in it. How I would love to have the time to develop that part of my brain. One day. I know you can picture Aunt Ruthie and the art on her walls which is where I photographed many of these pictures. You express yourself in the artistic way you entertain – cooking and baking your heart out! By the way, we still have a pressure cooker and some large pots we retrieved from Mother’s attic for you to use. If you make it down this fall, contact me and I will tell you where to find them. Once – twice actually – I wrote in jest about my Aunt Ruthie as a Cheater, probably before I met you online or face to face. I’ve repented of my evil ways now and portray her here as the nice lady she really is. I hadn’t thought of her legacy that way before, bit indeed you are right! Thanks, Rebecca! How fortunate for you to have Aunt Ruthie in your childhood to inspire you. I too believe that art making, including writing, is active prayer. When I first started following your blog, the website banner included a view of your writing space with art displayed on the walls, I believe. It was then I knew that you have multiple abilities to express yourself. I felt a kinship from the beginning. So glad we have met in blog world and then in February, face to face. Art for both of us is a sacred act – yes, active prayer. Always nice to see you here posing with your doggie! Just wonderful Marian thank you! To me, this post says that ageing is an art as Aunt Ruthie has shown and that art comes from within and while there’s life there’s creativity. Aunt Ruthie is aging as gracefully as can be expected as she reconciles herself to memory loss. You have provided a good summary of the connection between art and critical thinking. I couldn’t have said it better. You have a great weekend too, susan. 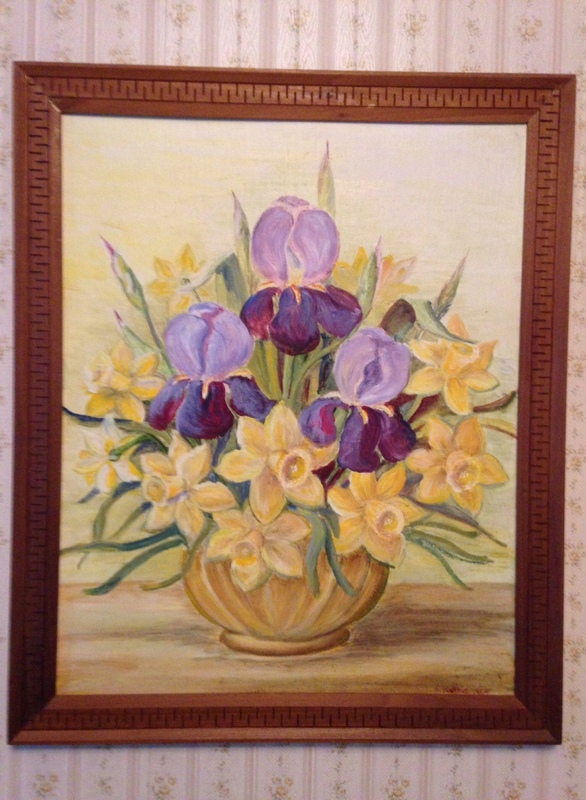 Marian … Your Aunt Ruthie Longenecker is a very talented artist whether it’s with crayon, oil painting or flower arrangements. My Mom, and many of her sisters, showed their artistic flair thru knitting and crocheting. I can still recall a two piece rose-colored dress my Mom knitted. She just looked gorgeous in it. I can tell from your blog posts that you teach with your head and your heart, the best combination. Students are lucky to have an English teacher like you who encourages their talents beyond the verbal. Thank you for your “Amen” to my Aunt Ruthie tribute today. I wish she could comprehend what is happening online in her behalf. The last time I visited her, she listened to musical recordings my son made for her on a MP3 player, which made her smile. Art and music can bypass cognition and minister directly to the mind and heart. Thank you. Art and music have the power to reach the heart and soul. That’s so sweet of your son to make those recordings for your Aunt Ruthie. Our son Joel lived with Aunt Ruthie for a year between his junior and senior years in college. They have always had a special bond. Thank you, Judy. Exquisite. 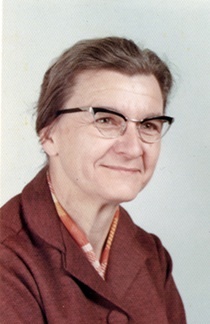 Aunt Ruthie is an inspiration, and to think she was your aunt and your teacher. How fortunate you were. That white birch glows with spirit, as do many of her other pieces. I don’t know of anyone in my family who was a visual artist. My Grandma Edna in Missouri was a pianist and mezzo-soprano, so her home was always filled with music. Her pies were artistic and maybe even a little spiritual for a young girl who was hungry for treats. First I got to hear her sing in church. Then the pie. Those were good Sundays. I love your echoes here. In fact, the last three sentences of your comment sound like poetry to my ears. It ain’t easy, but we might be bored by easy. Marian, I have complete faith in you and your writing talents. As you can see from my blog, I’m in experimental mode. I never know what will strike a chord, but I have to let myself roam a little. A lovely post about the importance of art! And those paintings are just gorgeous! You are an expert photographer. Now I wonder whether you have some other artistic skill – drawing, painting perhaps? I can imagine you are crafty in other ways too. What a talented lady! Long may she continue. Thanks for reading and sending good wishes. She is in good health and is well cared for, but has serious memory loss and at times is aware of what she is missing.